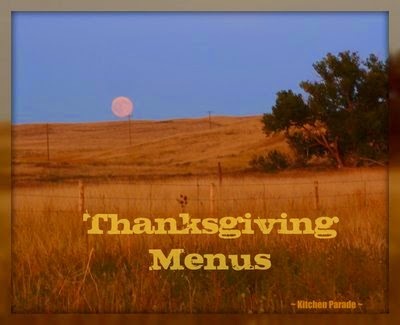 With Thanksgiving fast approaching, these Thanksgiving menus may inspire your own celebration, whether traditional, make-ahead, casual buffet, an intimate table, vegetarian, lower-calorie – plus a bonus, my own "dream" Thanksgiving menu! Use an entire menu or better yet, mix and match a new recipe or two with your own family favorites. All the recipes are from Kitchen Parade or A Veggie Venture, my food blog about vegetables. The "full corn" moon shot was taken somewhere just east of the Wyoming-Nebraska border, a lovely hilled area with ribbon roads snaking eastward. We topped a hill to see a huge moon just above the horizon. By the time we stopped and I'd scampered to the side of the road to frame the shot, the moon was already half the size, although still mammoth. Still more amazing? Behind us to the west was a beautiful mountain-view sunset! Both shots are "straight out of the camera" (except cropping) taken with a brand-new "vacation" camera, the 10mp 12x zoom Panasonic Lumix. By recommendation, I'll tell you that I took this camera on vacation the first time doing something I don't recommend, taking an unfamiliar camera on a trip, without even having read the book. That said, I put the camera on "auto" and we just started shooting and hoping. Lucky, it worked out beautifully. I wish I could take credit for discovering this camera but can't. For months, I looked at one point 'n' shoot camera after another, never finding exactly what I hoped for in a single package, feeling both frustrated by indecision and overwhelmed by all the choices. So when Lydia Walshin from The Perfect Pantry and the cookie-baking non-profit Drop In & Decorate mentioned she'd bought the camera for a trip to Brazil, I ordered one the same day – and am so glad I did! Update: We used the Lumix as a "vacation camera" for five years, then the lens was scratched. We looked at other cameras, then bought another Lumix! We love its pictures, the ease of shooting and how easily it fits into a pocket or a purse!